A suitable liquid, the working solution, rather than a mechanical process in the absorption chiller is used to dissolve (liquefy) the refrigerant vapour before the refrigerant is compressed by the solution pump while in its liquid state. The refrigerant will then be guided to the refrigerator where it is expelled from the solution again by means of added heat. The gaseous refrigerant can now be liquefied in the condenser just as in a regular compression chiller. The actual cooling effect by evaporating the liquid refrigerant in the evaporator is, again, achieved in the same way as in a compression chiller. The primary operating power behind the absorption cooling process is the heat fed to the generator. 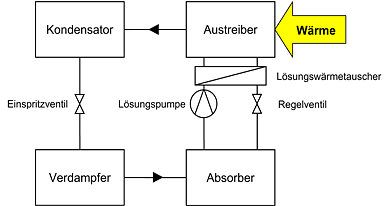 Electric power is required only to a small extent for the operation of the solution pump. The energy flows for both technologies are displayed in the illustration. The cooling capacity required by electrically driven compression chillers is generated by a supply of electric power. The cooling tower is only needed to dissipate the refrigerant's heat of condensation in addition to the operating power. 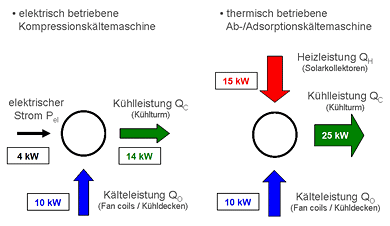 As the primary operating power utilized by absorption chillers is heat, the diagram neglects the portion of the operating power that is made up of electric power. It is, however, essential that the drive heat supplied to the machine - in addition to the cooling capacity, which, from a physical standpoint, is extracted from the cooling medium - be dissipated into the environment via a cooling tower. Compared to compression chillers, the re-cooling capacities of absorption chillers are, therefore, significantly higher. The diagram makes allowances for this fact by the appropriate size of the block arrows. While the cooling capacity (blue arrow) is identical, the required refrigerating capacity (green arrow) is greater. The specified capacities are examples of a EER=2.5 compression chiller and a COP=0.65 absorption chiller.